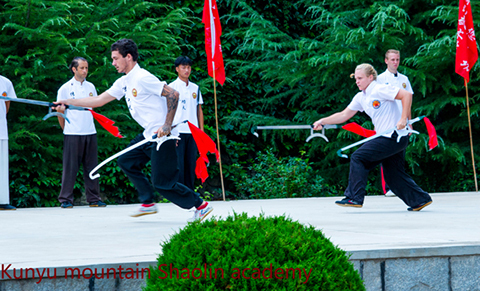 Kunyu Mountain Shaolin Kung Fu School offers classes taught by full-time professional Wing Chun masters. Learn more about the history and culture below. Wing Chun (also wing tsun or Yong chun in Chinese) kung fu is a splendid Chinese southern internal fist style. 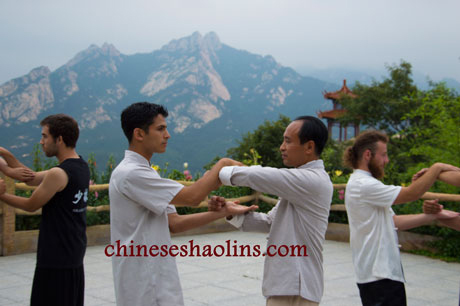 There is a saying that there is Tai chi in the north and Wing Chun in the south. Wing Chun has a rich 200 years history, but it is less known than other Kung fu styles. With continuous improvements by descendants and with the development of society, it has become a great historical treasure in the history. Originally, only rich young men could have the chance to learn this martial art, which was called “Shaoye fist” (shaoye means a son of a rich family). But nowadays, people have the opportunity to learn its practical value, wisdom, and connotation. Below are some photos of Wing chun training with professional Wing chun masters here. Click to enlarge. There are many stories about the origin of Yong chun. Among these, the one that it was created by a nun, Wumei, is the most popular. It is said that the southern shaolin temple was burnt by the Qing government in the year of Emperor Kangxi (1654-1722). Five masters (with high kung fu ability) survived that big fire. 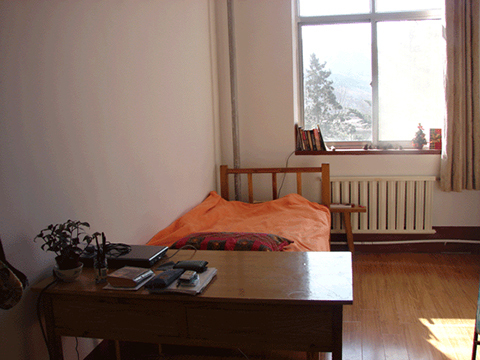 Of all the masters, Wumei fled to Daliang Mountain, which lies in the border of Sichuan and Yunnan province. The other four masters were Zhisha, Baimei, Feng Daode, and Miaoxia. After arriving at Daling Mountain, Wumei saw a snake and a crane fighting and learned their fighting principles (crane attacks the center and snake moves flexibly). Then she created a new martial art system which was different from her own fist style and changed “CHANG QIAO DA MA” (forceful and bold) to “DUAN QIAO ZHAI MA”. This martial arts system focuses on borrowing power, defending and attacking at same time, protecting and using your center and winning with smart force. The birth of Wing Chun comes from snake and crane, but it is different from the other animal fist. So, Wing Chun is not purely imitating food-hunting or fighting motions of a single animal, but it comes from the enlightenment of fighting between snake and crane, combining the motions of snake and crane together.Fatefully, Wumei saved Yan Yongchun, who was being forced to marry someone she didn’t want to. She taught Yongchun her fist form. After that, Yan got married with Liang Bochou, who was from the Jiangxi province and taught Liang this fist form as well. Learning this fist form helped Liang win against other people for a long time, but he had no idea what the name of this form was. As he learned it from Yan Yongchun, he named it “Yongchun fist” to show his appreciation. Liang Bochou then passed it to his nephew Liang Langui, who later passed it to the performers of a theatrical troupe named “Foshan Red Boat”: Huang Huabao, Liang Erdi, and Lujin. Huang and Liang introduced it to a Foshan person named Liangzan. Lujin passed it to two Foshan people: Feng Shaoqing and Guo Baoquan. Master doing Wing chun Liu dian ban Staff. Feng Shaoqing was employed as a sergeant after learning Wing Chun fist and spent most of his lifetime fighting for a living. At the same time, Ruan Qishan who was from a rich family had an interest in Wing Chun, which he learned from Guo Baojin. Hearing that Feng Shaoqing had gone back to Foshan living as a hermit, he went with a large amount of money to ask him for training. 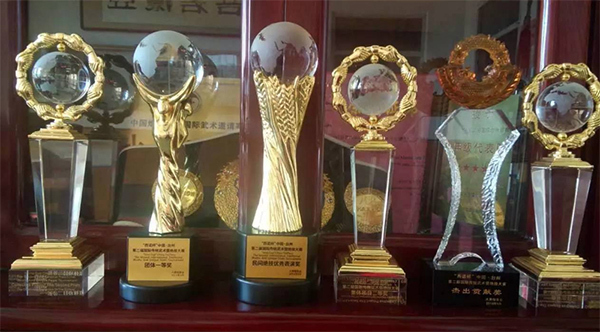 Through several years of hard work, Ruan Qishan’s skill matured and he became famous around the Foshan area. He was called “Yongchun San Xiong” along with Ipman and Yaocai. This title made Ruan Qishan a legend. After that, he taught all his skills to Cenneng (1926-2002), who sold desserts in a restaurant when he was 13. The food maker and Wing Chun master Zhangbao liked him a lot, so he took him as a disciple and taught him.Later on, they recommended he learn medical arts from Wei Yusheng. Ruan Qishan, Zhangbao’s best friend, also appreciated his training and talent. Later Ruan Qishan passed the whole system to him. Then he set up a medical museum in Guangzhou to teach Wing Chun fist, taking in lots of disciples. He promoted Wing Chun at maximum in Guangzhou, and he was named “The father of Guangzhou Wing Chun” and the most talented martial arts genius in over one hundred years. Until the generation of Huang Huabao and Liang Erdi, there were only word records about Wing Chun. These two people worked in theatrical troupe named “Red Boat”. After retiring from their career, they respectively passed on Wing Chun to a Foshan person, Liangzan.Liangzan, whose nickname is Mr. Zan, was a very famous and rich Chinese doctor in Canton and a top martial artist as well. But he seldom mentioned to people which style of kung fu he learned. Throughout his life, he only had four or five disciples, and two of them were his sons. From the time of Chen Huashun, Wing Chun had stepped into a half-publicly teaching state. At that time, learning Wing Chun was very expensive. People who wanted to learn had to go to the master with money. The price was as high as the real estate value of several streets. So people who had the chance to study Wing Chun were all rich young men. Ip Man was one of the rich young men in Foshan. Ip Man followed Chen Shunhua, learning Wing Chun since he was very young and came to Hong Kong to study.By accident, he met Liangbi who was the son of Liangzan and did business in Hong Kong. Then he followed Liangbi, practicing Wing Chu in Hong Kong and returned to Foshan again. At the end of 1949, Ip Man started living on teaching Wing Chun in Hong Kong. Since then, Wing Chun fist started to be widely passed. 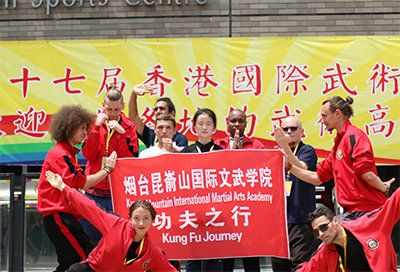 The strongest characteristic of Wing Chun is “DUAN QIAO ZHAI MA”, which is suitable for people without any martial arts basics to learn and master. For people who have martial arts basics, they will excel faster. Wing Chun fist is scientific and humanized and its strong point lies in fighting closely: Punching is fast, guarding is continuous, and horse stance is flexible to move quickly and sustain energy. 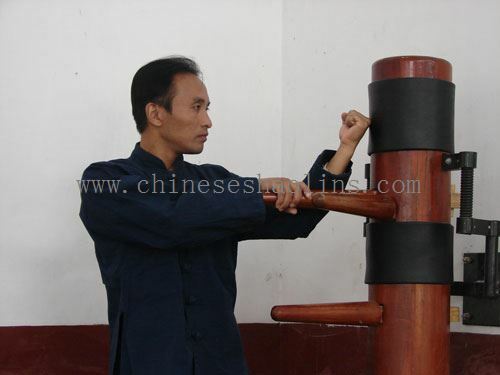 Wing Chun has basic forms such as XIAO NIAN TOU, XUN QIAO, BIAO ZHI, and wooden dummy form. Additionally, there are specific Wing Chun fist forms and weapon forms.When practicing forms, we practice sticky hands and practice reactions after touching each other. There is a kind of “CUN JIN” which is a way to make power for attack and defense. It is particular about attacking and defending with as short distance as possible and as quick as possible. Additionally, there is another way to study Wing Chun, TENG QUAN, which contains three main ways to practice body gestures and skills mysteries. 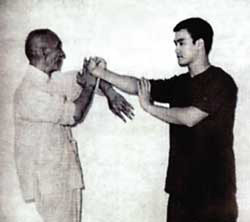 To practice the angle, direction, and power within the limited space, TENG QUAN can help improve the flexibility and softness of shoulder, elbow, and wrist, enhancing the coordination of the hands.Through the interaction between QIAO SHOU (former part of arm) and TENG QUAN, the hearing and conditioning abilities of QIAO SHOU can be improved. 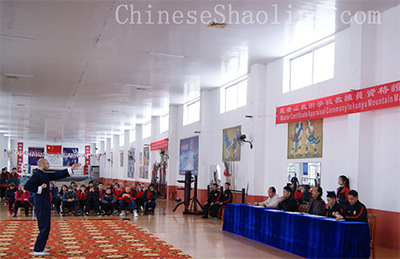 It also helps to express precisely the main requirements of Wing Tsun. Thus, people who practice Wing Chun can make use of center theory and offensive &defensive techniques consciously, laying a solid foundation for future study and sparring. Moreover, people who practice Wing Chun TENG QUAN can also improve the ability of self-saving and counterattack ability when hands are controlled. Master doing Wing chun forms. Wing Chun Twelve Seeds is the most basic form of Wing Chun fist. It takes the intensive defense and attack of central line as its main substance. As for its offensive characteristic, punching is at same time as kicking, steps move at same time as your palm. In this way, it doesn’t give the opponent any chance to counterattack. Twelve Seeds focuses on practical use. And each move has deep meaning and various applications. To learn Wing Chun well, first you have to master the Twelve Seeds form as well as "central line" and "Cun Jin".Modern Wing Chun Fist existed in Guangdong, Fujian, and other places. With the influence of films and TV, it has spread rapidly into hundreds of countries in China, Asia, Europe, North and South America, Africa, Oceania, and so on. Currently, it has become a compulsory combat skill that is often mastered by multinational agents and Special Forces. It is a practical combat martial art that has a rich culture of humanity and the poise of a gentleman. 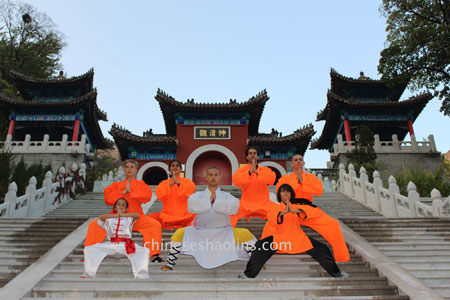 At the Kunyu mountain shaolin kungfu school, you can learn Wing Chun and many other martial arts styles from some of the most respected masters in the world. 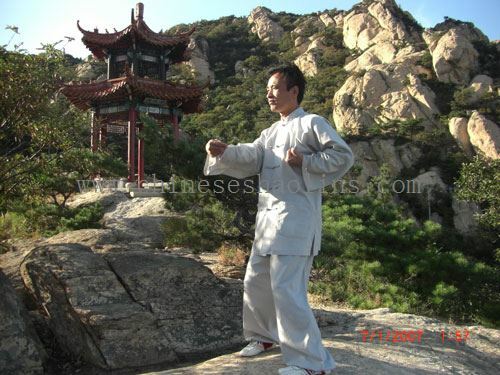 Click here see learn Wing chun in China Kunyu mountain video on Youtube.